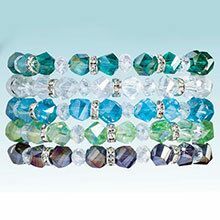 Bold, vivid colors provide the perfect accent—worn together or on their own! 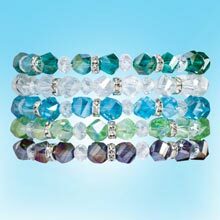 This Crystal and Bling Bracelet Set features faceted beads available in a rainbow of hues and are paired with sparkling rhinestone spacers to create these dazzling stretch bracelets. These fun pieces are a great way to add a little pizzazz to an otherwise ho-hum outfit. They make well-received gifts, too! Who doesn't want a little glitz and glamour in their life? One size fits most. Set of 5. Hurry! Quantities are limited!